Alfina Lundgren Obituary - Shrewsbury, Massachusetts | Britton Funeral Homes, Inc.
Alfina A. (Jonaitis) Lundgren, 97, of Shrewsbury died peacefully Sunday June 17, 2018 surrounded by her loving family. Mrs. Lundgren was born in Worcester and raised in Shrewsbury daughter of the late George Jonaitis, Sr. and Augustine (Elinskas) Jonaitis. She graduated from Commerce High School and later married her first love, Edward J. Lundgren Sr., together they raised their family and operated their family business in the town that they loved, Shrewsbury. Mrs. Lundgren worked alongside of her husband, Edward and her brother, George proudly owning and operating the family business, Lundgren & Jonaitis Dairy for over 50 years. She found time to give back to the Town of Shrewsbury as well, during elections she served as a precinct warden at the Harrington Ave Fire Station; she was a Rotary Ann while her husband was a member of the Rotary. She was a Brownie and Girl Scout Leader and a member of the Frist Congregational Church in Shrewsbury. She was one of the few female private pilots in Massachusetts and flew many hours with her friend and fellow pilot Olive Borgotti. You could also find her on the golf course playing a round or two with friends or quietly gardening in her beautiful flower and vegetable gardens. Her beloved husband, Edward, died in 2001. 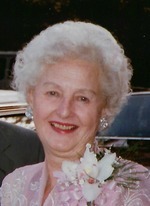 She leaves her loving family, Dianne S. Moalli of Shrewsbury and Edward J. Lundrgen, Jr., of Westborough; two grandchildren, Edward J. Lundgren, III of Boston and Eric Lundgren of Wakefield, RI; two great grandchildren Lindsey and Travis Lundgren of Wakefield, RI; also survived by her loving and compassionate niece and caretaker, Judith Guertin and many other nieces and nephews. Beside her husband, she was predeceased by her siblings Anne Turnblom, Helen Keddy, Isabelle Jonaitis and George Jonaitis, Jr.
Funeral services for Mrs. Lundgren will be held privately. She will be laid to rest next to her husband in Mountain View Cemetery, Shrewsbury.